Along with his contemporary Goya (1746-1828), Jacques-Louis David was the last of the great Old Masters, prior to the industrialization of Europe, and a highly influential contributor to French painting during the Revolutionary and Napoleonic eras. He trained under Joseph-Marie Vien (17161809) and, after several attempts, duly won the coveted Prix de Rome (1774). While studying in Rome, he was greatly influenced by the masters of the Italian Renaissance (like Raphael), as well as Nicolas Poussin (1594-1665) and Caravaggio (1573-1610). He also met and admired Neoclassicist Raphael Mengs (1728-79), who introduced him to the theories of Johann Joachim Winckelmann (1717-68) concerning the art of Classical Antiquity (1000 BCE - 450 CE). In 1780, filled with enthusiasm for the discipline and rigour of republican neoclassicism - a welcome change from the decadent softness of the Bourbon monarchy under Louis XVI - he returned to Paris where he was elected a full member of the French Academy and exhibited at the Paris Salon of 1781. He also married Marguerite-Charlotte Pecoul, the teenage daughter of a wealthy French builder. Over the next decade, David established himself as the leading exponent of Neoclassical painting, with masterpieces like Oath of the Horatii (1784, Louvre Museum, Paris), Death of Socrates (1787, Metropolitan Museum of Art, NYC), and the highly political Lictors Bring to Brutus the Bodies of His Sons (1789, Louvre Museum, Paris). The decade culminated in the onset of the French Revolution (1789-99), during which he joined the extremist Jacobin Club, and became a virtual dictator of the arts, thanks to his friendships with revolutionaries like Robespierre and, in particular, Jean-Paul Marat, whom he immortalized in his masterpiece Death of Marat (1793, Louvre, Paris). Note: Contrast David's idealization of war with Goya's less hopeful attitude as seen in The Third of May, 1808 (1814, Prado, Madrid). Derived from Roman Legend, as outlined about by the Roman historian Titus Levy, Oath of the Horatii is a history painting which portrays a scene set in 669 BCE about a dispute between two rival cities, Rome and Alba Longa. The rulers of each city have decided that, instead of ordering their respective armies to fight each other, they will each select three individuals to do the fighting for them. In Rome, three brothers from the Horatii family agree to fight on behalf of the city, against three brothers from the Curiatii family from Alba Longa. 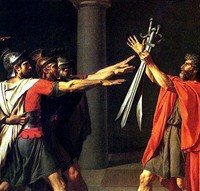 The painting depicts the three Horatii brothers saluting their father who holds aloft their swords. In addition to the three Horatii brothers, the painting also shows the women of the family who are all heartbroken at the situation, because of ties of marriage and betrothal between the families (see below). Despite these ties between the two families, and despite the lamentations of the women, the three Horatii obey their father's call to save their beloved republic. The painting was commissioned by the king's minister of fine arts Charles-Claude Flahaut de la Billaderie, comte d'Angiviller (17301810), who specified that it should be an allegory about loyalty to the state (and therefore to the king). But David painted a slightly different picture, set in republican Rome, with no king involved. Furthermore, while the picture does indeed promote the values of patriotism and masculine self-sacrifice for one's country, it indicates that this loyalty should take priority over everything - even the family. This highly political painting which proclaimed the overriding importance of the Republic, brought David international renown and confirmed his position as one of the finest neoclassical artists in France. Although executed some four years before the French Revolution, and less overt in its message than David's later picture - The Lictors Bring to Brutus the Bodies of His Sons (1789) - the Oath of the Horatii became one of the defining images of the day. Neoclassicism stands for values such as stoicism, self-sacrifice, duty, patriotism, gravitas, action and reason. Thus in the context of a decadent France, ruled over by the Absolute Monarchy of the Bourbons, with its frivolity and absurd self-indulgences, the idealized art of classical antiquity was a perfect medium for David's message. The idealized faces and bodies of the men, bunched together for solidarity, with their determined looks and taut, outstretched limbs: all this conveys an intensity and clarity of purpose, as they take their oath of allegiance to Rome. The trio express no emotion or doubt about the nature of their patriotic duty. They are ready and willing to make the ultimate sacrifice. But there is much more drama in the scene. Behind the father of the three Horatii brothers, the women of the family sit weeping. The woman on the far right is Camilla, the sister of the Horatii brothers who is also betrothed in marriage to one of the Curiatii fighters. She weeps because she knows that whatever happens she will lose someone she loves. Next to Camilla is Sabina - her Curiatius sister-in-law - who weeps for her Horatius husband and her Curiatius brother. In the background, the mother of the family comforts the two children, one of whom belongs to Sabina. Note: According to legend, none of the Curiatii and only one of the three Horatii brothers survives the battle. He returns home to find his sister Camilla cursing Rome over the death of her Curiatius fiancé. Horrified to hear his beloved Rome being cursed, he draws his sword and kills his sister. Although initially David intended to depict this final scene, instead of the Oath, in the end he felt it was too graphic. But however noble the theme, it is the artist's painting ability that creates a masterpiece. In this case, David's painterly methods are masterly and provide a perfect illustration of the neoclassicist style. The figure painting is exceptional, the drapery is outstanding. The emphasis is on clear, hard details with none of the soft-focus brushwork favoured by the Rococo. And in the best traditions of academic art, the artist has gone to great lengths to eliminate any brushstrokes so as not to distract the viewer. David depicts masculine resolution in the straight arms and legs of the brothers, reflecting the strong columns in the background. In contrast, female sensitivity is portrayed in the curves of the women, echoing the arches which are supported by the columns. The use of straight lines to symbolize strength is also shown in the swords, only one of which is straight, perhaps indicating that only one brother will survive the battle. Colour is also used to convey messages. The brother nearest to the camera wears red, matching the robe of the father, and white, matching that of Camilla, perhaps implying that he is destined to be the only survivor. In true neoclassical style, The Oath of the Horatii provides an idealized story which illustrates the nobility of putting civic duty before personal preference. In its emphasis of republican values, rather than the divine rights of the monarchy, and in its promotion of reason rather than emotion, it clearly reflects the principles of the Age of Enlightenment and heralds the era of modern art to come.  Pilgrimage to Cythera (1717) by Jean-Antoine Watteau. Louvre, Paris; Charlottenburg Palace, Berlin.  Wurzburg Residence Frescoes (1750-3) by Tiepolo.  The Swing (L'Escarpolette) (1767) by Jean-Honore Fragonard.  An Experiment on a Bird in the Air Pump (1768) by Joseph Wright of Derby.  The Nightmare (1781) by Henry Fuseli.  For more outstanding neoclassical paintings, see: Homepage.